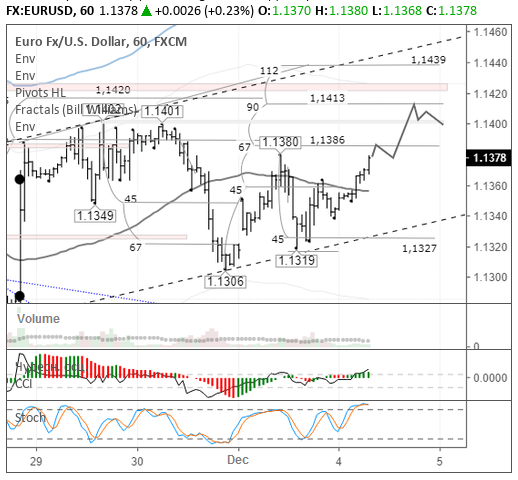 On Monday the 3rd of December, trading on EURUSD closed up. The bullish momentum, which formed during the Asian session against the background of a 90-day truce between the US and China, did not last long. The euro fell against the US dollar in trading in Europe after the British session, and in the American session recovered losses as USD weakened. Many major currencies traded in positive territory before the close of trading. The ISM business activity index amounted to 59.3 (forecast 57.7, previous 57.7). 12:15 UK: BOE’s Governor Carney speech. 12:30 UK: PMI construction (Nov). 13:00 Eurozone: PPI (MoM) (Oct). 16:30 Canada: labor productivity (QoQ) (Q3). Our expectations for yesterday were proved true. Despite the positive results of the G20 summit, EURUSD dropped to 45 degrees. Since the level hike was small, I did not build new levels from 1.1319. The price has recovered to the 67th degree. Since the stochastic oscillator is in the sell zone, the risks of a decline to the lb 1.1356 increased. During the Asian session the dollar traded in the red, while the main cross EURGBP traded in the black. The price rebounded from the bottom line of the rising channel. I do not see anything that would prevent a return to the level of 1.1413.